From our inception in 1959, the Medford Gospel Mission’s purpose has been to break – not perpetuate – the cycle of homelessness. We firmly believe every person is created in the image of God, and because of this, we see in each man and women the potential to live a meaningful life, something much better than living on the greenway or in the public parks – getting a meal here, a coat and blanket there, constantly in danger from the elements and those who wish to do them harm. 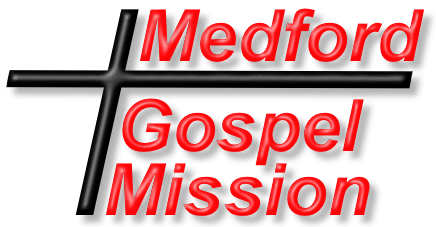 The Medford Gospel Mission is about restoration, restoring people to a wholeness of life in our community. With restoration as the goal, we operate clean-and-sober facilities for men, women, and mothers with children, that are safe places to heal and strive. Locally, other non-profits are reaching out to individuals who are not clean and sober, but our priority is to provide a safe and healing environment to those seeking change and who are ready to work on their addiction challenges. People active in their addiction create safety concerns and are triggers for people trying to stay clean and sober. Our doors are open to most anyone who desires to change and do the hard work of restoration. Our restoration programs seek to address the very things that hold individuals back and provide healing in five key areas, equipping them to live healthy lives as members in our community. 1) Spiritual Restoration – At our core we are committed to the Christian faith, in fact “Gospel” is our middle name so we reflect the love of God in everything we do, but the best thing we can do for someone walking through our doors is to introduce them to Jesus Christ. 2) Emotional Restoration – The classes and groups as well one on one coaching that we provide helps our guests through the trauma from past experiences as well as emotional challenges that have led to lifestyle choices and addictions. 3) Social Restoration – All the men and women in our programs live on site and engage in community living, learning through the give-and-take of relationship as they work side by side to keep the Mission’s services running smooth as well as working with volunteers to be engaged with the wider community. 4) Physical Restoration – Many of the people that come to us for help have physical issues as a result of past addiction issues. We have made it easy to seek medical help by teaming up with La Clinica who assists them with medical care. 5) Educational Restoration – Many of our program participants face financial obstacles that prevent them from finding suitable housing so we help them set realistic goals for their future and help them overcome barriers that get in the way of seeking meaningful employment. The homeless challenges in our community are not simply going to be answered by addressing the lack of affordable housing, but by personally investing in the lives of individuals, and walking along side of them as they do the hard work of restoration that leads to a place of dignity in our community. With the continued help from people like you, we can make a huge difference in eliminating homelessness one person at a time. Thank you for your prayers, financial, and volunteer support! May the Lord bless your holiday season.